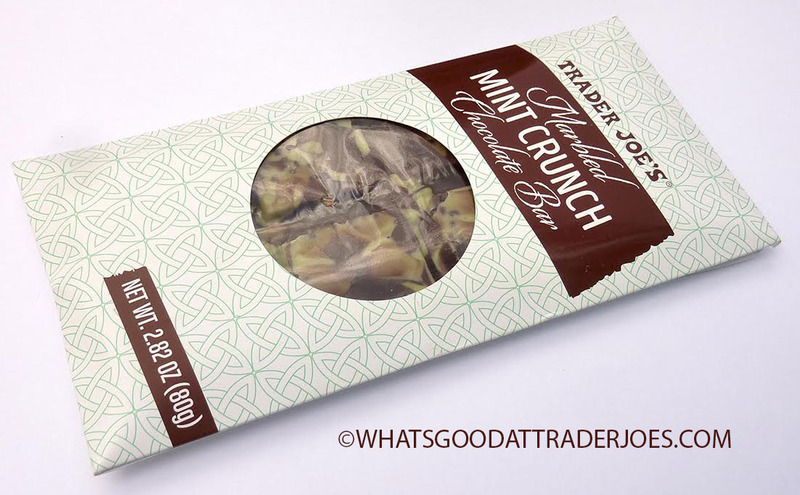 Another day, another Trader Joe's chocolate bar. 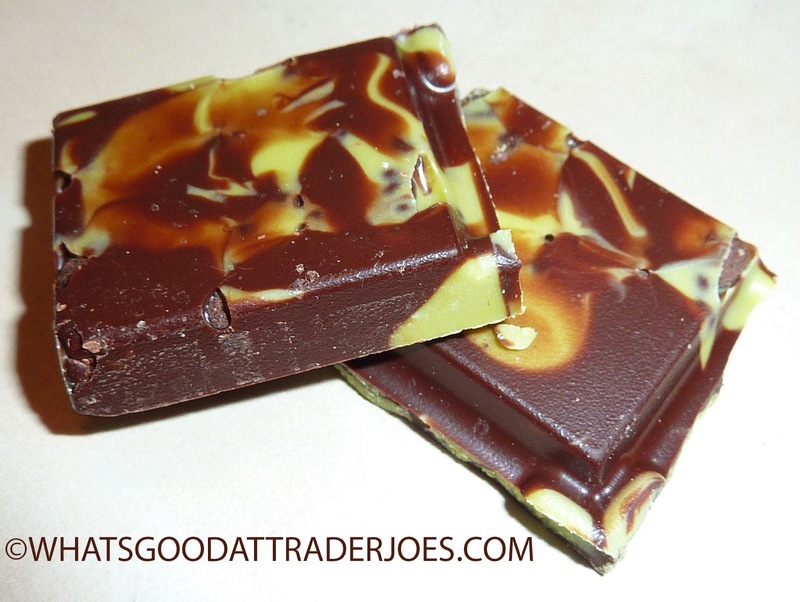 This one has white chocolate, dark chocolate, and swaths of minty magic running through it. Also, there's a nice little crunch factor here. If you like sweet treats with that crispy cookie vibe, a la Crunch, Krackel, or Kit Kat, then look no further. And I know some of you are chocolate mint or "grasshopper" fans. 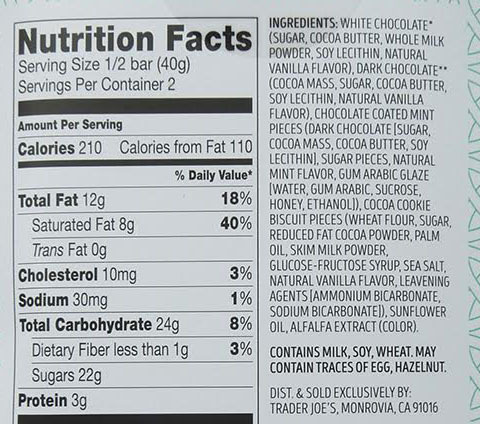 If so, this is the candy bar for you. Just imagine those original Andes candies with all the layers marbled instead of laid flat on one another, and then changed into perfect squares instead of rectangles. Then imagine each piece with small bits of cocoa cookie biscuit inserted into it, to provide a delicate crunchable brittleness to each bite, and then lay eight squares together in two rows of four squares each, and fuse them all together to make a chocolate bar. That's what you have here. In my opinion, it's a nice balance of mint and chocolate. 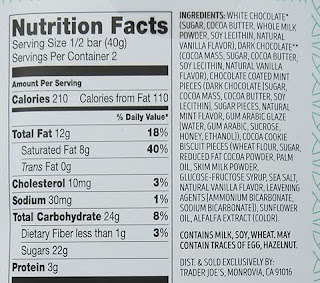 Despite the fact "white chocolate" is listed first on the ingredients, the bar neither looks nor tastes that way. If I had guessed at the type of chocolate employed here without looking at the back of the packaging, I might have wagered it was milk chocolate. I guess the white and dark balance each other out somehow. Sonia thinks the mint is a little too strong. But then again, she's not a big fan of mint and chocolate together. I think the ratio is just about right. If I were to change anything about this bar, I'd ask for more crunch. There are probably more than enough cookie bits for the average person, but I think they make the texture more interesting, so I wouldn't mind if the crunchability increased dramatically. Another point to ponder: it's a product of Ireland. I'm not sure how that makes sense economically to import something as simple as chocolate and mint, but I don't presume to question the methods of Almighty Joe. Three and a half stars from me. Three from Sonia. Bottom line: 6.5 out of 10. Here’s an important fact about me: I have a big sweet tooth and I love chocolates. Can you tell me where I can get this?